Funny little Ivy had a wonderful birthday party, despite being in the middle of an episode. She really enjoyed having the day(s) be all about her. We had planned on having the Andrus side of the family over on Saturday night, with Melissa and Kim. Unfortunately, after a very difficult fever filled night, we were going to cancel. But, with the calender being so packed, at the last minute we decided to still have it. By going back and forth, we lost Melissa, but everyone else was able to make it. 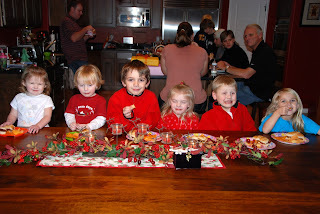 (The Sanford's joined us on Sunday for our annual fried oyster party). 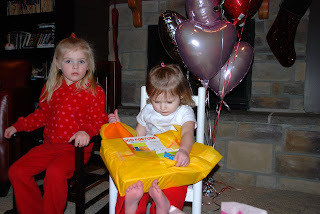 Ivy got many fun presents that were mostly based on her love of playing make believe. 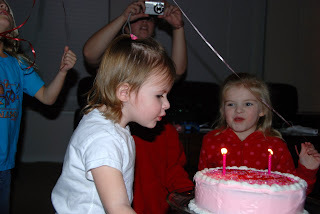 She had two candles to blow out, but it was a good thing that her sister was there to help. To top off her birthday filled with toys to build her imagination, We, together with both sets of grandparents, gave her a very cute kitchen. She seriously plays with it almost all day every day. 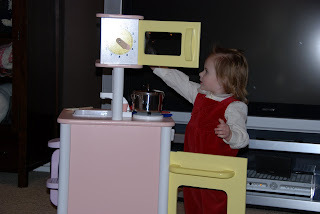 We're going to have to get her plastic pots and pans just to quiet the noise a bit. Ivy is very tall and average weight for her age. We are so blessed to have her in our family.